Changing the Queen's Life Guard at the plaza of Horse Guards is a lesser known event than the change at Buckingham Palace, but it is a more intimate affair with no barriers between guards and the public. The Queen's Life Guard is actually part of the senior regiment of the British Army, and has stood at Horse Guards -- the official entrance to St. James's Palace and Buckingham Palace -- since the Restoration in the mid-1600s. Two mounted soldiers are on duty and changed every hour. 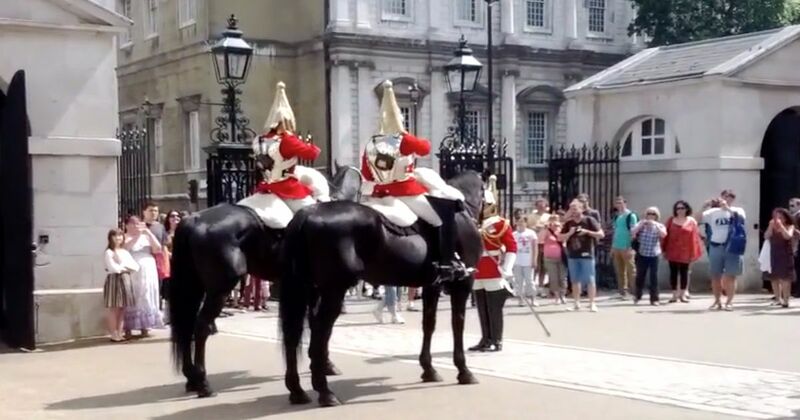 The 4 p.m. changing ceremony, called the Dismounting Ceremony or Four o' Clock Parade, exchanges mounted guards for foot guards until the next morning. And, thanks to an incident in 1894, it also includes an inspection by an officer. It is said that Queen Victoria discovered the entire Guard drinking and gambling and neglecting their duties one afternoon. As punishment, reports Guided Walks in London, the Queen demanded a daily inspection be conducted for one hundred years; the time frame has passed, but the ritual continues for the sake of tradition. Normally, the Dismounting Ceremony carries on without a problem -- these are highly trained soldiers, after all -- but a video uploaded to YouTube in August 2013 demonstrates that working with animals always produces unexpected moments, even for the most elite soldiers. As the mounted guardsmen line up before the inspecting officer, one of the horses repeatedly tosses his head and appears distracted. In a heart-stopping moment immediately after the dismount, the horse rears and falls over backward as tourists gasp in concern. The horse stands up right away and appears unhurt as it is led away by soldiers in both modern and traditional uniforms.